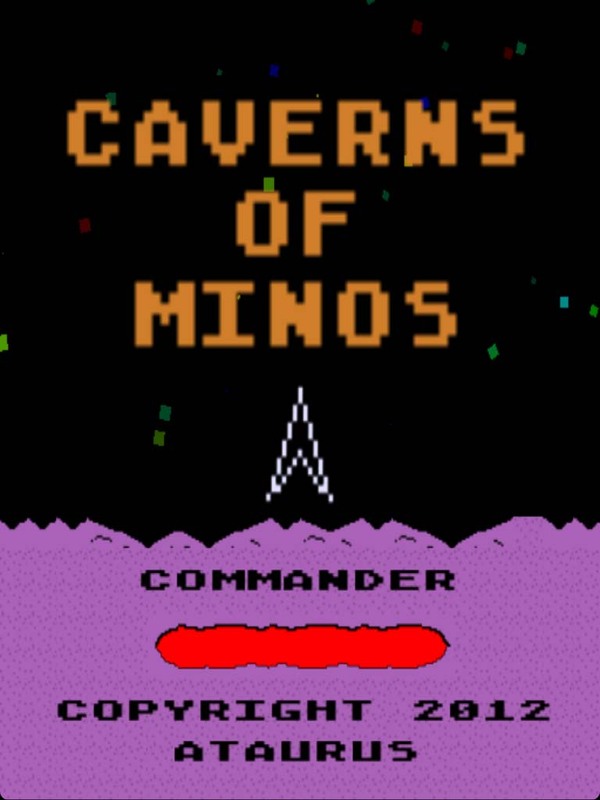 10 word description: Shooting/rescue game inspired by various retro/8 bit genres. 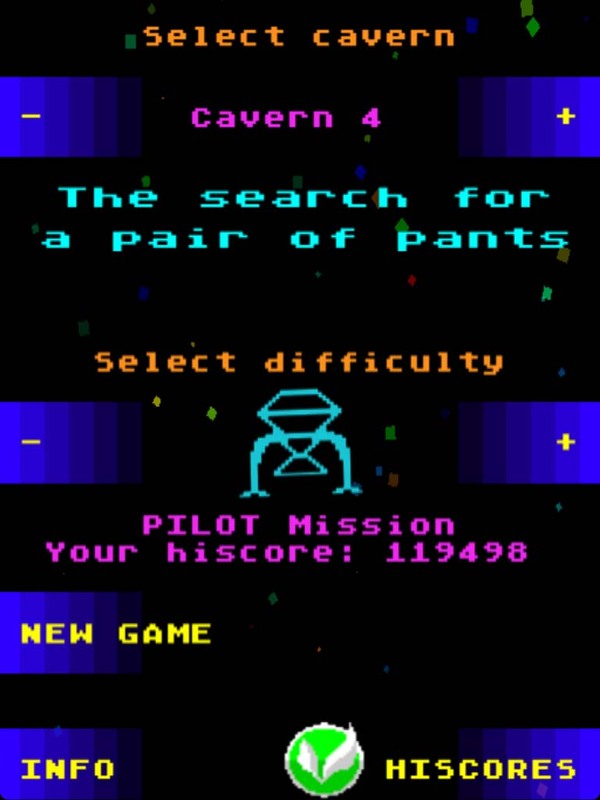 10 word review: As close to perfect as an iOS arcade game can get. 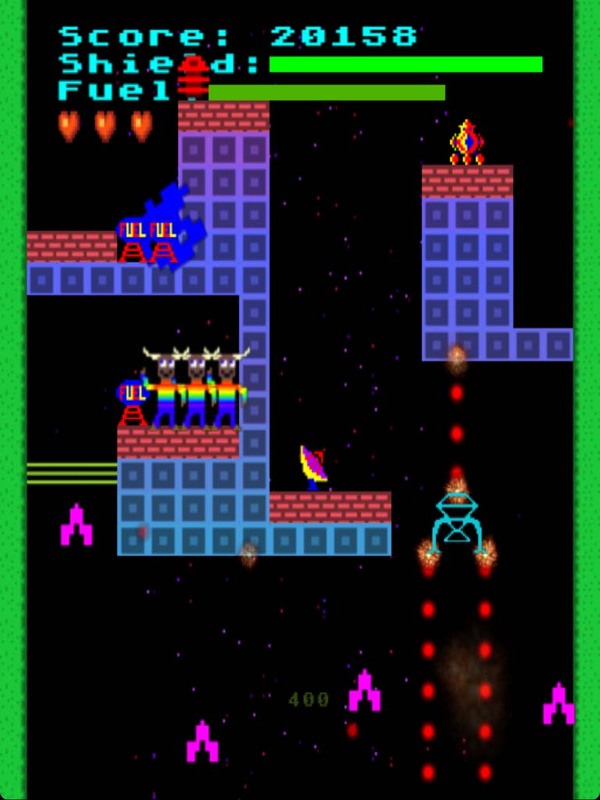 You will like this if you enjoy: Retro arcade games, other Llamasoft / Jeff Minter games. 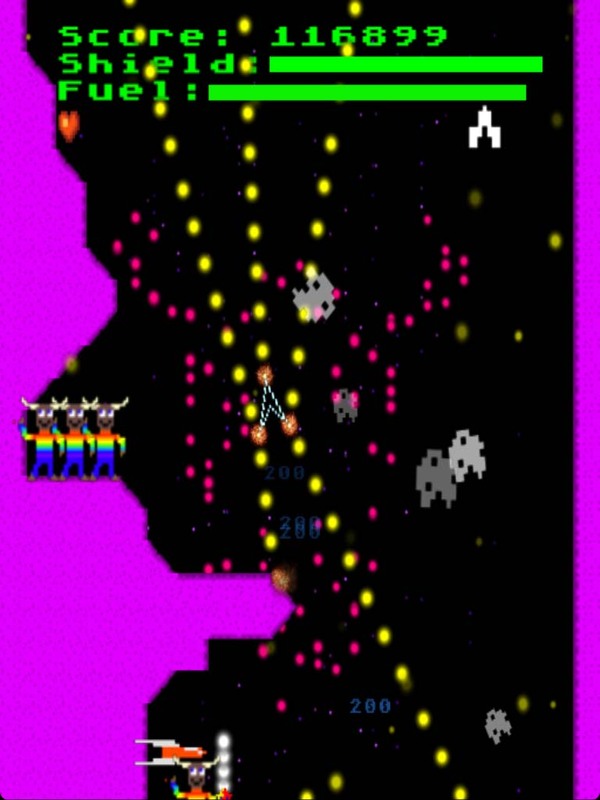 How about a game where you’re simultaneously playing Lunar Lander, Asteroids and Scramble during a frantic neon firework display? Other games that this has drawn inspiration from, or could be compared to – Caverns of Mars, Lunar Rescue, Oids. The good news: Wonderful gameplay; in my opinion, Jeff is getting closer to the perfect iOS arcade game with every release. Great graphics; the animals and general silliness are still there, of course, but everything looks vibrant, colourful and consistent with the theme of the game. No music, but the sound effects are superb; from the varied voice effects to the flatulent radar gun things there are always some delightfully weird noises accompanying the visual treats. 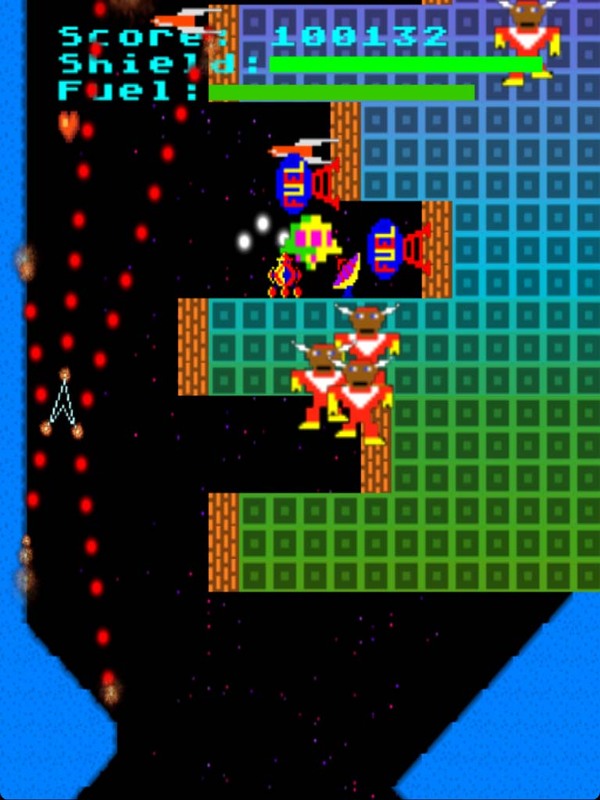 Controls are what I’d expect for a Llamasoft iOS release – perfectly suited to the game and with no on-screen joystick or buttons. The bad news: It’s probably just me, but I’d like to try the thrust zone (I won’t say button, because there isn’t one) at the bottom right, rather than top right on the iPhone, although it feels right where it is. On the iPad it’s at the bottom, which is perfect on that size screen. 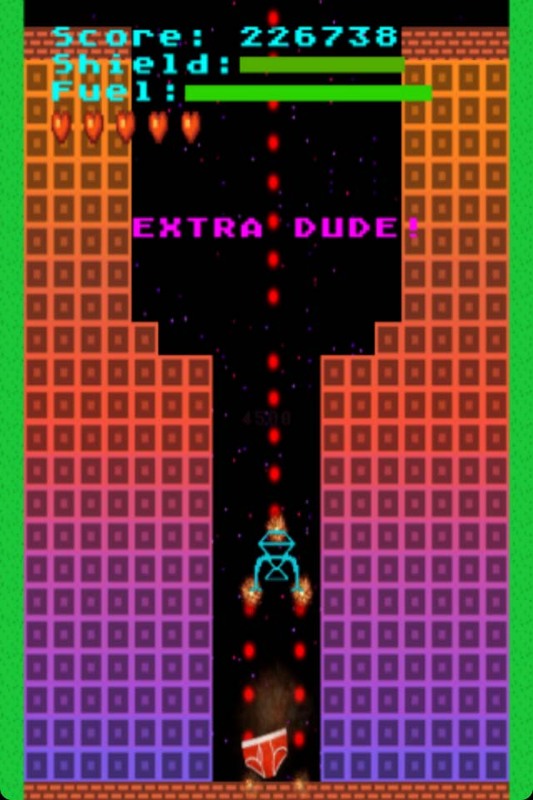 Arcadelife verdict: An immensely fun, playable and great looking work of genius. What I find interesting is that I can play better on the hardest difficulty setting (Commander) than the other difficulties because the Commander ship controls like the ship in Asteroids, with rotate and thrust instead of the left/right & thrust of the other ships. Depending on how you get on with Asteroids style controls, you may have a similar experience. What’s great about this game is that behind the explosion of colours and barking missiles (I am sure they are barking), there’s rock-solid and very rewarding gameplay that feels like it had been developed in an eighties arcade environment by very demanding gamers. And, seriously, where else are you going to find a game where a large sheep (in space) sends you on a mission to retrieve a chicken jalfrezi? Or a pair of pants?